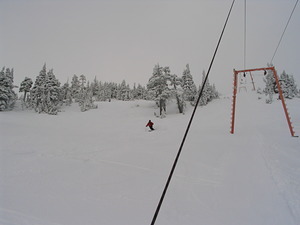 Situated on the north end of Vancouver Island, Mount Cain offers a unique experience to skiers, snowboarders and backcountry skiers. At Mount Cain you'll find deep powder, 21 runs, with 1499 vertical feet of terrain. We're open three days a week (weekends and select Mondays) which permits the powder to accumulate all week. Mount Cain has few line-ups and the welcoming atmosphere of a family oriented mountain. 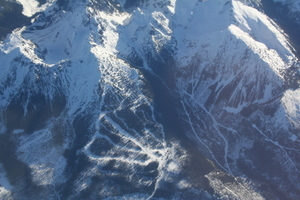 Mount Cain has the highest base elevation of any coastal ski hill in BC, Alaska and Washington State. Our peak elevation at 5920'is second only to Whistler. Mount Cain is located near Schoen Lake Provincial Park and is run by the non-profit Mount Cain Alpine Park Society, Vancouver Island's only community owned and operated ski hill! Mount Cain saw skier visits rise from 3078 in 1991 to over 10,000 in 2010, which still averages out to less than 200 skiers per operational day. Mount Cain is now open for the season with a great start, lots of fresh powder snow and a new kitchen in the Cain Cafe to serve you better. It mostly rains and smells like dirty socks.